Over at AfriGadget, we usually call something an AfriGadget if it is a DIY solution to a problem or situation to which there just isn’t any ready-made solution available. In places where you just can’t go to the next hardware store and buy a ready-made solution, an AfriGadget is such an attempt for a working alternative. I would even go as far as saying that Germany, for instance, is a very modular country (with many regulations & technical norms) and consequently offers many ready-made solutions that can just be purchased and instantly used. Spare parts for cars, houses, technical equipment – you name it, there’s a norm on it and a place where you can buy it. Erik of WhiteAfrican recently argued that “If it Works in Africa, It will Work Anywhere”. You may or may not agree with this provocative thesis, but it also shows that we are still consuming many products in the “developed” countries which were actually made for our consumer behaviour. And these things are also exported to Africa. Anyone in the diaspora who has ever exported his older laptop for members of the extended family back home also knows that it may probably be broken once he/she returns during the next holiday. Most conventional laptops are just too fragile to withstand the heat, dust, unstable power supply, malware and other threats the relatively rough life on “the dark continent” has to offer. And battery runtime with an average of max. 2h is often below par. Netbooks are simple, often light-weight small computers with a simple (but modern) CPU, enough RAM, a harddisk, a small screen (7″-10″), 2-3 USB ports, a sound card, WLAN connection and a card reader. They sometimes even come with an internal Bluetooth adapter so you can connect your mobile or other Bluetooth-enabled equipment to such a little machine. Oh, and it also has a webcam which is neat. Most importantly though, many current netbooks are quite durable and even survive rough conditions. Take my netbook, for example. I’ve purchased this used Asus eee PC 901 a month ago – and while I am still struggling with it’s tiny keyboard layout – I just can’t stop thinking that it could or should actually be THE killer device for use in many developing countries. My netbook doesn’t have a conventional magnetic (rotating) hard disk, but instead comes with (slow) SSD flash memory. Like the one found on USB memory keys. 12 GB for the operating system, programs and some private data. Battery runtime is beyond 5h on this little baby – which means that it’ll even survive the next power failure. And since the tiny CPU inside doesn’t consume too much power, it could also work from the electricity generated via solar panels (a technology that’s already quite popular in many rural areas). And here’s the bonus: most future netbooks will be sold with an internal UMTS modem, so you just insert your SIM card and go online. From anywhere where there’s network coverage. (I am actually saving on an Asus eee 1000H Go which has a 10,2″ screen, a better keyboard and an internal 3G modem). The term “netbook” may be a bit irritating though (besides of this legal battle) as we all know that Internet broadband connectivity is still very limited and expensive in many developing countries. Instead, these little computers are much more than just very mobile computers with very good battery runtime: they are sufficient for most needs. I’d say that at least 90% of your average tasks can be done on such a machine. Surfing the www, checking your e-mails, writing texts, spreadsheets, games – you name it, it does it. The only thing it doesn’t have is an internal DVD player, so your illegal DVDs purchased at that junction downtown probably won’t play – unless of course you connect an external DVD player via USB. As long as the iPhone or maybe also some new Google Android phones are the only mobiles with a decent web browser (@Nokia: the S60 browser is NOT a decent solution), netbooks may be the perfect alternative platform and substitute the missing alternative. 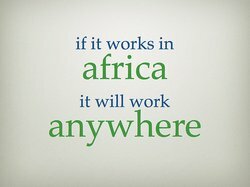 “If it works in Africa….”….no, if it works anywhere else, it will also work in Africa. “70% of Netbook sales so far have been in Europe“ – where they are often only used as second computers or desktop alternatives to those who just want to surf the net from their couch. In many developing countries though, Netbooks could imho be the entry platform and substitute the otherwise missing or broken (older) computer system. Why? Because they are cheaper, more durable, come with their own power supply and are mobile enough to be shared by many different members of a family or local community. And that’s why I consider netbooks to be real AfriGadgets. A solution to a problem we have in the past often tried to cure with mobile phones and their still ailing browser software. I couldn’t agree more, the extended battery life would be what we are all looking for especially when on the road. Internet hotspots in Kenya are notorious for NOT providing power sockets. Netbooks are increasingly popular in the market but the price difference with conventional laptops is still very small but I trust they will hit critical mass within a very short time. Let’s hope that prices will drop further – Acer already lowered theirs in a first attempt, offering basic 8,9″ Linux devices for below ~ EUR 200. The many GNU/Linux distros with a special focus on Netbooks are another advantage I haven’t mentioned here (=> no malware => more productivity; support for GSM devices). Probably one of the best posts i’ve read in a long time, while I agree and see where you are going with this one. I have to pose an interesting question or challenge to you. 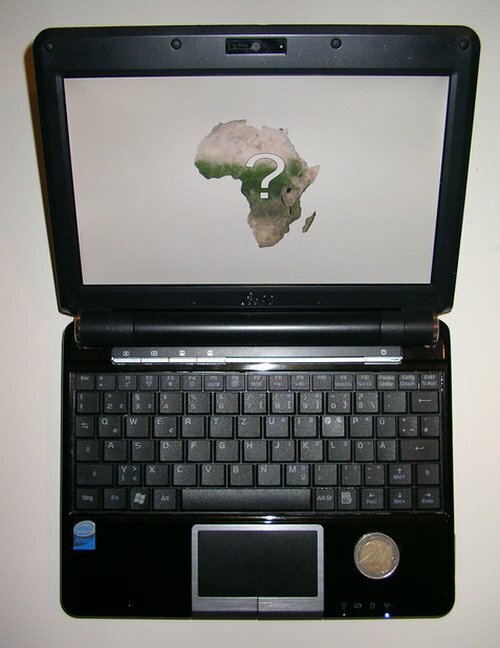 To me the netbook is just a device, to call it an Afrigadget wouldnt be ideal because it assumes that the device by itself will solve most of Africa’s connectivity and IT usage problems. the underlying factors I think for me are platforms, people buy laptops today in Kenya to access content that is not available in Kenya. People buy mobile phones to access content that is in Kenya. Do you see where I am going with this? I dont think the netbook should be the answer to Africa if Africa doesnt have a framework to make local content available on the Netbook or any other device that will come up. To me thats the ultimate solution in Africa/ Kenya because if these devices will only be available to people who can afford yet there is no local demand, local content and local material then the NETBOOK will just end up being a device for the “people like me” (a particular class and status of people) Its a sad and sorry truth I believe. Just my two cents.. But none the less I enjoyed the post because I too have been keen on the NETBOOK and think its what AFRICA needs, but I am thinking more in terms of enabling the framework around the netbook and other portable devices. Awesome article, and good points. Netbooks also seem like they might be good for kids? @Lexi: Yes, they are perfect for kids. Erik also gave his 4G eee PC to his daughters. @Leo: That’s a damn good question about the local content. Like local content for phones, netbooks may also help to propel the development of local services – although, again, connectivity is the issue here, I guess. Phones were made for 1:1 communication, but computers? It would be interesting to see local WiMax solutions coming up that could help promoting local content. In the US during Netzero, AOL, Compuserve,Prodigy, we used dial up, I remember Netzero had a lucrative business model around dial up. Businesses didnt complain about connectivity, businesses adapted to the burgeoning internet wave, 56K was an issue but we were all excited to access content and develop this new thing called the web. To me its seems like Kenya is just waiting for Bandwidth and then they will attempt to solve all these issues that they think they are having because of bandwidth… I dont think it works like that, I think we make do with what we have… Just like we did with the mobile phones – although again I have to go back to platforms.. if there is no platform for local developers or businesses to build apon all these devices and utilities will go to waste.. Ive seen this happen over and over again in Kenya.. I bought an OLPC on the Give 1 Get 1 plan a year ago. I was just curious about it but I admit that I was impressed by the ruggedness of it and the screen is much better than I expected. But I have looked at a couple of netbooks, a Lenovo and an Asus. The annoying thing about the OLPC from an adults perspective is the keyboard. The netbooks have better keyboards in terms of usability, but I think most netbooks could be broken much more quickly than the OLPC. The netbooks are considerably more powerful than the OLPC-XO1 though. The OLPC can get bogged down on a lot of websites that do fancy graphics.